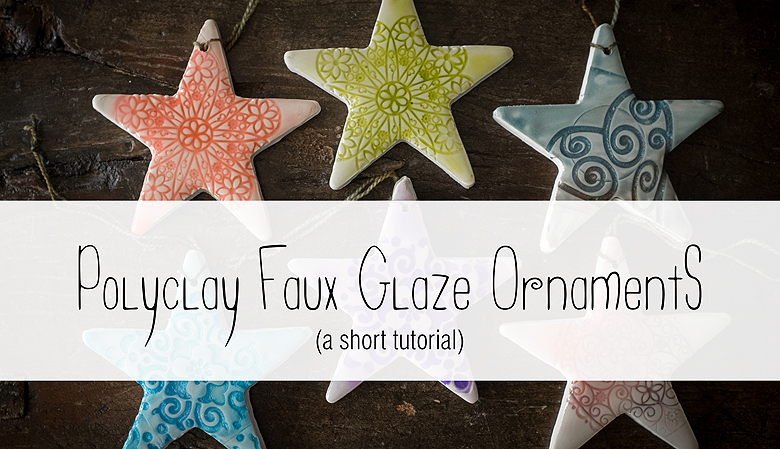 Continuing on with my Christmas theme, I wanted to share a tutorial on another method for making polymer clay ornaments with a completely different look-faux glazed pottery. This is super simple, fun, and the results are so pretty! 1. Cover your work surface with parchment paper to protect it. 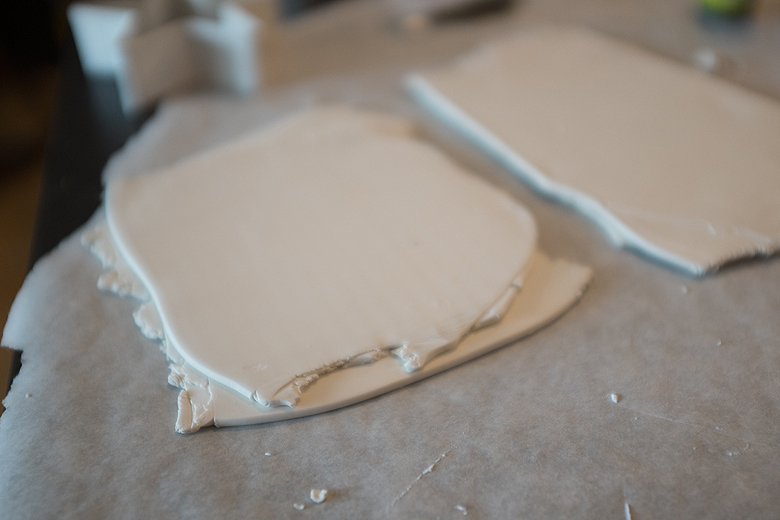 Roll out your clay until you have an even sheet about 1/4 inch thick. 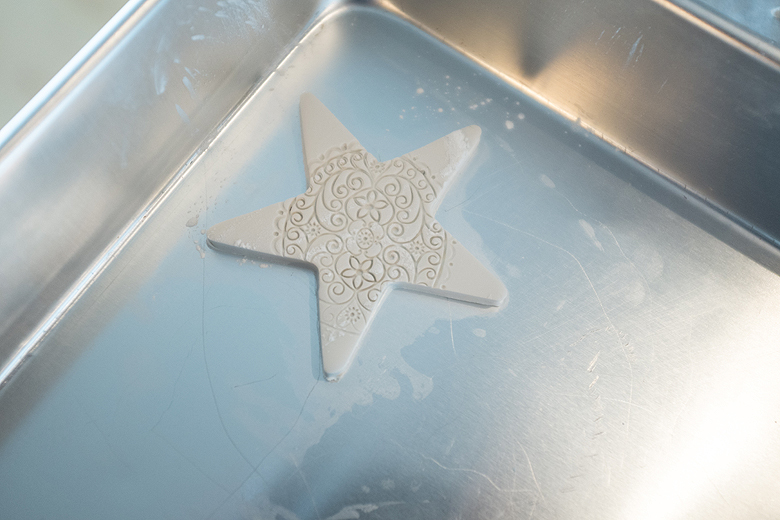 To avoid distorting your piece, work directly on the surface you plan to bake it on if possible. 2. 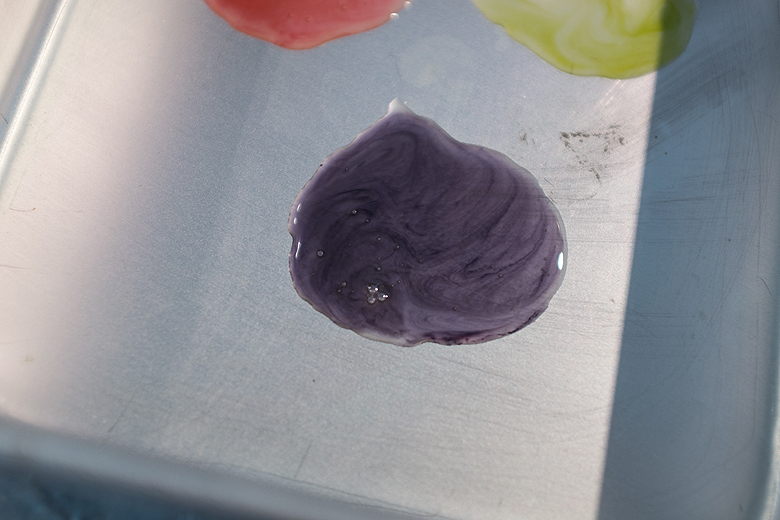 In a separate area, mix liquid Fimo clay with a few drops of alcohol ink. Leave this aside to give the alcohol a few minutes to evaporate. 3. 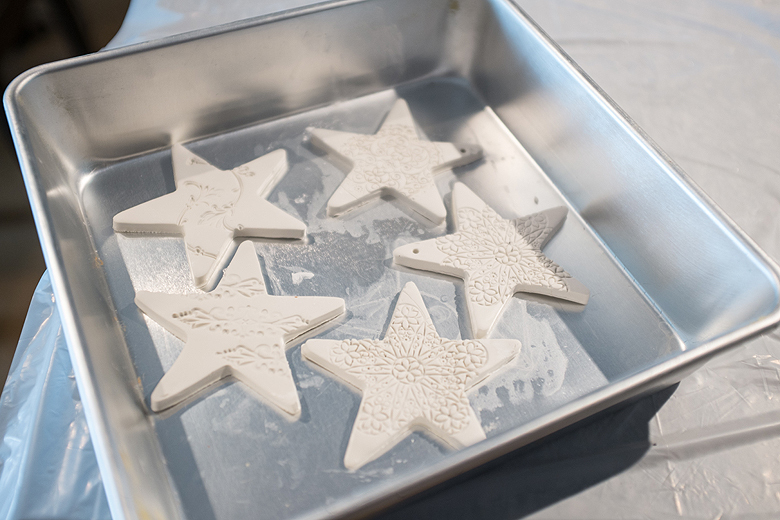 Dust some talc powder onto your clay, to prevent the mold from sticking. Press your mold firmly into the clay. You want your recessed areas to be deep enough for the glaze to pool, but not so deep that you create thin, fragile areas in the clay. 4. 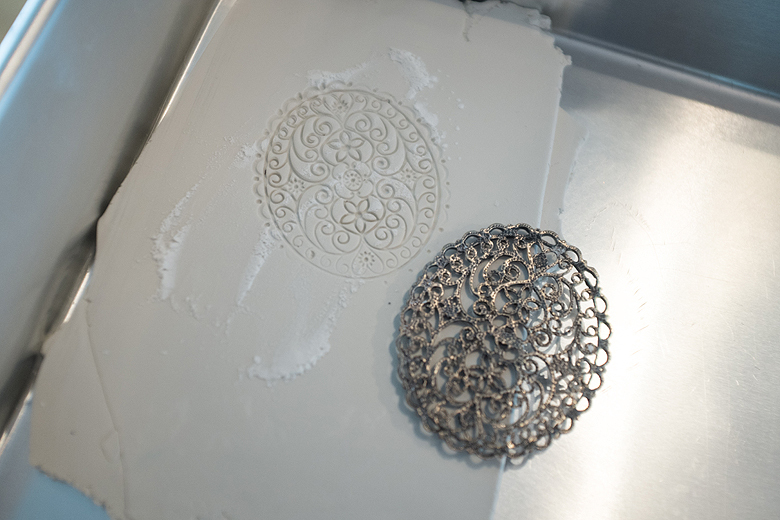 Press your cookie cutter firmly onto the clay. 5. 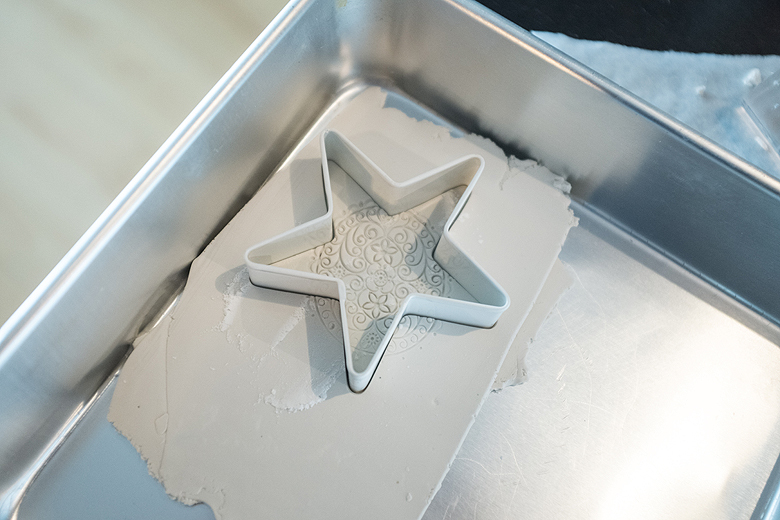 Remove the clay that’s outside of the cookie cutter, leaving your piece in place. You can use your drinking straw at this stage to creat a hole for hanging, simply press the straw down into the clay to remove a cylinder for a hole. My pieces do not show holes because I chose to drill them afterwards, which is also an option. 6. When you’ve made a few, bake according to the manufacturers instructions. 7. 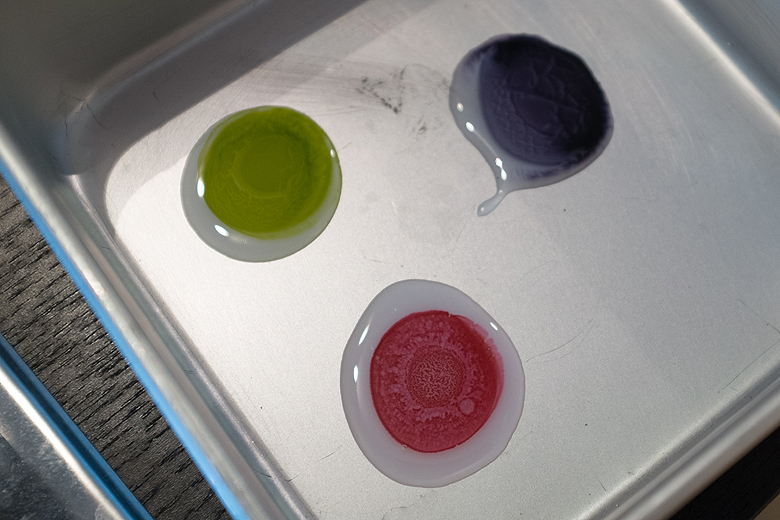 While your pieces are cooling, mix the ink into the liquid Fimo until you get a consistent colour. 8. Using your fingertips, scoop up some of the coloured liquor clay and smooth it onto your piece. The liquid will pool in the recess and be thinner on top,creating a pottery glaze look. 9. Re-bake your pieces for another 30 minutes, and set aside to cool before hanging. 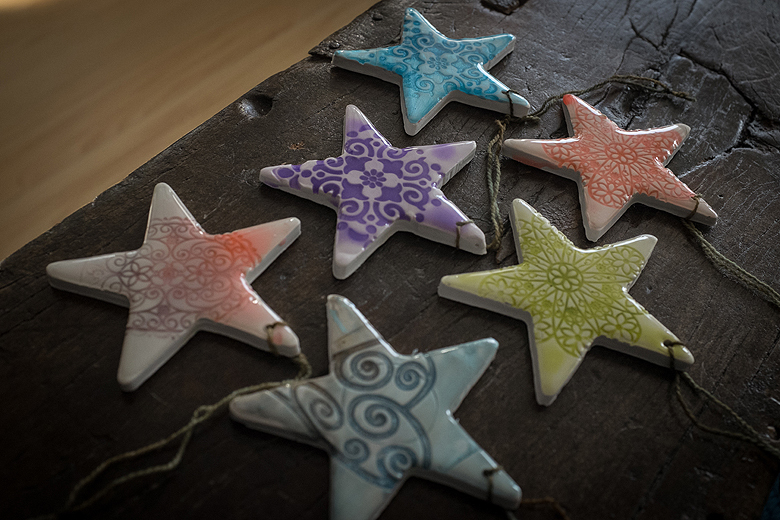 These little pieces make great ornaments for your tree, and also make great gift tags, or even pendants :) For a more metallic look, try adding Jacquard Pearl EX powder to the liquid clay instead of alcohol ink, there are tons of possibilities! These look amazing! Thanks for the clear instructions, it makes it a more approachable project. These are truly beautiful… I’ve not played with polymer clay or alcohol inks/liquid fimo (I’ve actually never heard of that! ), but your instructions make everything so clear… I’m excited to give these a try – thank you for the tutorial! I love the idea, but never worked with this type stuff before. 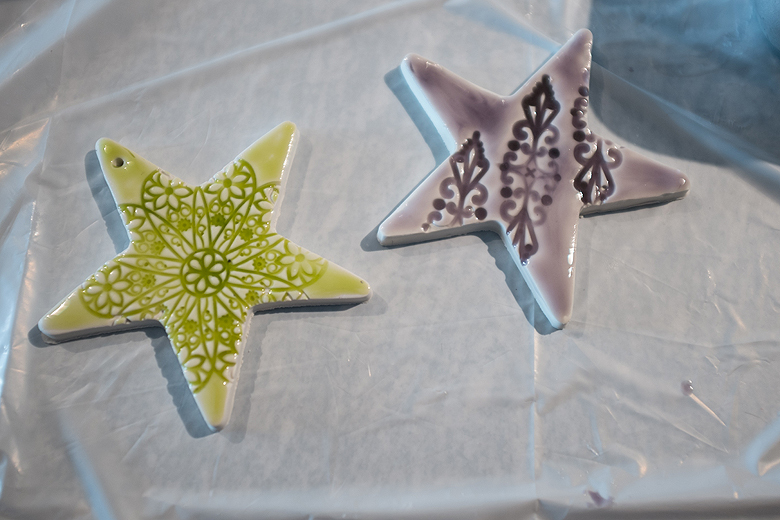 What if i just wanted to you cookie cutter and leave it white, what type glaze would i use? Thanks for your help! !